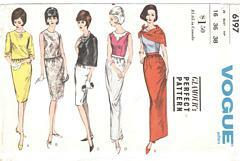 Versatile Vintage Vogue pattern for One or Two-Piece dress in two lengths. Boxy blouse in different lengths with neckline variations. Sleeves or sleeveless. Fitted sleeveless dress bodice has optional trimming. Eased skirt in regulation length or in-step length. Triangular scarf.